Hello lovelies! 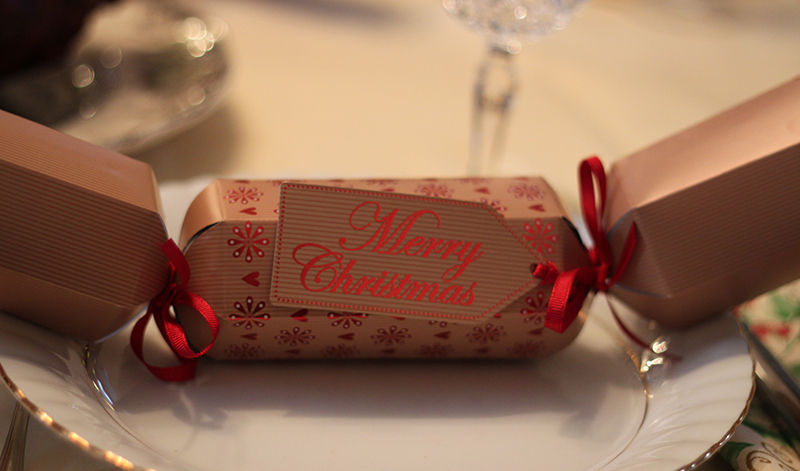 I hope you all had a great Christmas filled with family, laughter, gifts and a few too many minced pies. I had a great one, watched some great family films, played lots of games and ate far too much! I even managed to roll myself out of bed this morning and get to Brent Cross for some Boxing day shopping, sadly I didn’t pick up very much just a few bits of jewellery, a jumper and a t-shirt. I was planning to pick up much more but a few shops were closed, Zara’s sale didn’t impress me even half as much as I had hoped and the queue’s were generally quite ridiculous however I am thinking of popping to Oxford Street tomorrow. I thought I would quickly show you yesterday’s outfit which was actually taken on my new lense which I clearly haven’t got the hand of yet. I picked up a few midi dresses from Boohoo which arrived last week, although some were a little too thin and cheap I did fall in love with two. This one is a pretty Aztec print which I think is very versatile for both summer or winter as well as day and night. At only £15 I think it’s really worth it, the quality is nice as is the cut and if you get student discount it becomes and absolute steal at £12! I’m considering ordering some more! This time I paired the dress with red court shoes, they don’t really get much of an outing and I feel it added something extra rather than black shoes. My trusty leather jacket, Zara bag and gold jewellery finished the outfit for me. 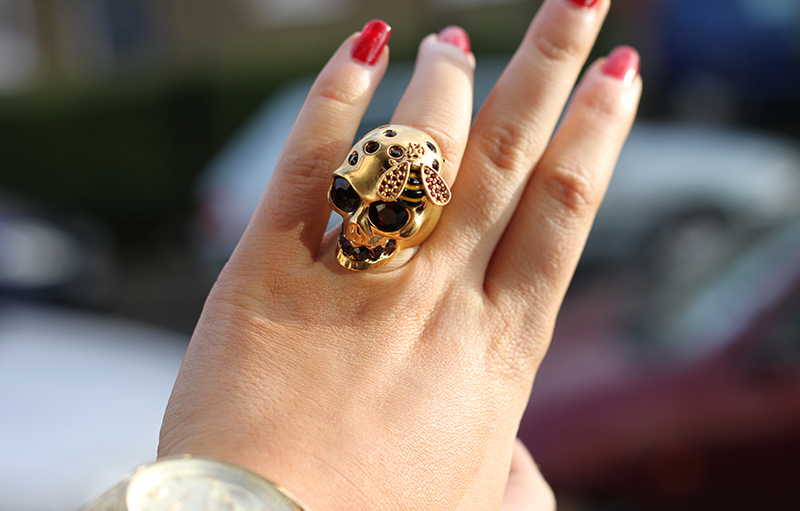 In love with new Christmas present; an Alexandra McQueen skull ring which although isn’t to everyone’s taste is completely to mine! If you are looking to purchase something off Boohoo don’t forget to sign up to student discount here. How was you Christmas? Did you go sale shopping today? 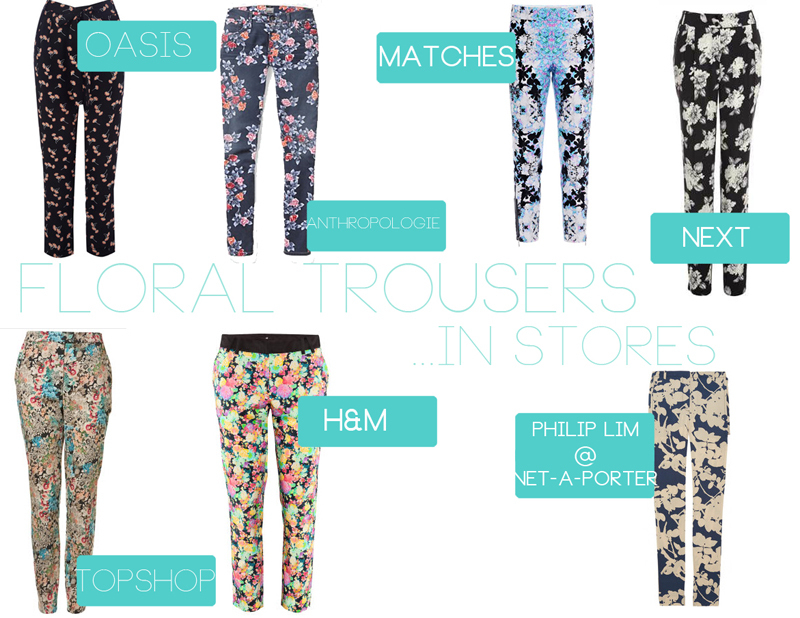 Over the last few years floral trousers have been everywhere, from celebrities to my favourite fashion bloggers. However when I posted this post of me wearing floral trousers a lot of people said they like the look on me but that they felt they couldn’t pull the look of themselves. I am a size 10/12 with childbearing hips and large thighs, so if I can wear them anyone can! I found these five looks by fashion bloggers which I love, each outfit is different some feature heels, some play it safe with black tops and black sures where as others wear bright tops or shoes. -Find the right pair- I like them to be tapered at the bottom, skimming over the thighs and with a higher waist. – If you are worried floral trousers will make your legs look a little fatter balance it out with a pair of high heels to add length and make your legs appear leaner. -If you are feeling brave and want to team your floral trousers with colours chose either a coloured top or coloured shoes not both, keep everything else neutral. These are some of my favourite finds…. How do you like to wear your floral trousers? I hope my post helps you all! This is a slightly different post for me, what do you think? Would you like some more? These weekend was my auntys surprise 40th Wedding anniversary party and I felt it was the perfect chance to whip out my red shoes and peplum top. I love this top as it has just the perfect amount of flair, at first I was a little worried as I have a large bust and wide hips but in fact I don’t think it made me look too bad. The peplum top is a very versatile top and has been seen on the runway of many designers such as Louis Vuitton and on celebrities such as Kate Middleton, Kim Kardashian and Olivia Palermo. I teamed mine with a black Body Con skirt which gave the illusion that I was in fact wearing a dress. I wore my most comfortable heels- my Primark Court shoes, Elizabeth Arden red lips and a L’oreal red nail polish to finish the look. Overall, I love this look and am sure I will be switching it up with different shoes or a different colour skirt.